Prolozone is a technique that marries concepts from neural therapy, Prolotherapy, and ozone therapy. It involves injecting various combinations of procaine, anti-inflammatory medications/homeopathics, vitamins, minerals, proliferatives, and a mixture of ozone/oxygen gas into degenerated or injured joints, and into areas of pain. The result of this combination is nothing short of remarkable in that damaged tissues can be regenerated, and otherwise untreatable pain can be permanently cured. The purpose of this article is to provide insight into what Prolozone is, and how it works. Let’s start with ozone. Oxygen is an atom that cannot exist in a stabilized form as a single atom. This is because it does not have enough electrons to balance it out. So in order to provide stability, two oxygen atoms bond together in close proximity and share electrons. This molecule, called O2, is what is generally referred to when the word “oxygen” is used. O2 is the stable form of oxygen that exists in the atmosphere. When an energetic force, such as electricity (lightening) or ultra-violet light (solar exposure), is imposed upon a molecule of O2, the two oxygen atoms are temporarily split apart into single oxygen atoms. Then, in a matter of nanoseconds these highly unstable oxygen atoms will pair up again and reform back into O2 molecules. But a small percentage of them will unite in a ménage-a-trio known as ozone. Thus, ozone, referred to as O3, is a gaseous molecule which consists of three oxygen atoms all sharing the same electrons. This is exactly what happens in a corona discharge ozone generator. Oxygen (O2) molecules go into the generator and are exposed to an electric spark. What emerges from the other end is a mixture of oxygen and ozone. The parameters of the generator can be set to produce a given amount of ozone in that mixture. In clinical circumstances the concentration of ozone in the final gas mixture is between 1-3%. In the therapeutic sections of this article I will be using the word “ozone” to refer to this mixture of ozone and oxygen. This process is referred to as dismutation. It does not happen when ozone is injected into tissue, but it does happen when ozone is kept in a syringe. It has been found that in a glass container at room temperature ozone will dismutate at a rate of 50% every 45 minutes. In a plastic container it will dismutate even faster, at the rate of 50% every 30 minutes. This is important to know because once ozone has been generated for a medical application; it must be used rather quickly. It can’t be stored and used later. As you can see, this fact somewhat limits the usefulness of ozone. I just can’t give my patient a bottle of ozone to take home with him, because within hours it will all have dismutated back into O2. Dr. Shallenberger filling up a syringe with ozone. An important precaution to note here is that, with the exception of ozone generators that are strictly used for air or water purification, in no case should ozone destined to be used for medical applications ever be made from room air! The reason is that room air contains 80% nitrogen, and when this nitrogen passes through the energy chamber, it is converted to nitrous oxide and nitric oxide, both of which are toxic in even small doses. 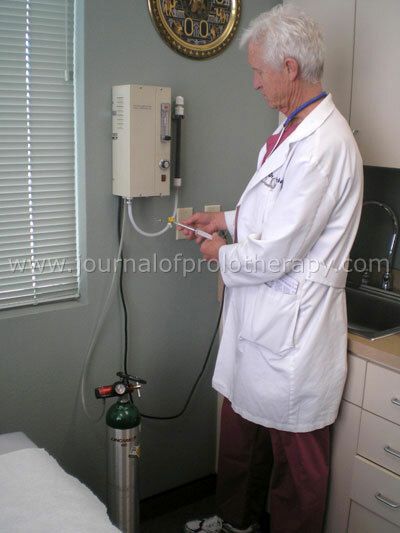 So it is imperative that only high quality pure oxygen be used to generate the ozone used for medical purposes. Before I delve into the next section, I need to define the term oxygen utilization. Oxygen utilization quite simply refers to how efficiently a cell or cells are converting oxygen to energy. Decreased oxygen utilization therefore refers to a condition in which oxygen is being less efficiently converted into energy. When a molecule of oxygen reaches a cell (specifically the mitochondria of the cell) there are two possible ways that it can be metabolized. One, in aerobic metabolism it can interact with either glucose or fatty acids to produce energy. Or two, it will be converted into free radical molecules. In a state of decreased oxygen utilization, more of it will be directed towards free radical production, and less towards energy production. This of course leads to a lethal one-two punch to the cell. It has less energy to maintain itself, and it is being increasingly burdened with free radical injury. Decreased oxygen utilization is at the root of all chronic disease, and I believe is also the fundamental cause of chronic pain and tissue degeneration. If Prolozone is not working simply as another form of Prolotherapy, how is it working? The answer to this question came to me one day as I was talking with a friend and colleague David Edwards, MD. Dave is a cardiologist, and the conversation was about myocardial hibernation. Myocardial hibernation is a term used to describe the condition in which there is a localized decrease in cardiac function due to localized ischemia. Restoration of normal coronary flow (e.g., by coronary bypass, chelation therapy, etc.) will restore normal function in the affected region. In other words, it is a localized area of tissue that is trapped in a state of reduced oxygen utilization. Restore oxygen utilization, and the tissue will function normally again. This same principle also applies to cases of cerebral infarct. Between the area of dead brain tissue and healthy tissue, there is a localized penumbra of brain tissue that is trapped in a state of decreased oxygen utilization. This tissue is not dead, but it is non functional. Restoring oxygen utilization to these cells with hyperbaric oxygen will often result in significant clinical improvement. I believe that Prolozone works by improving oxygen utilization in a localized area of damaged connective tissue, allowing it to heal, and to restore full function. We damage our connective tissues all the time. This is normal. In fact, it is controlled damage that is at the very heart of why exercise is so beneficial. When the tissue is damaged, stem cells and blast cells are called to the area of injury. Growth factors are stimulated, and very soon the damage is repaired. You sprain your ankle, and then it heals. You break your neck, and then it heals. That is, unless it doesn’t. Why is it that some injuries never heal, and go on to become areas of chronic pain and dysfunction? What happened to the healing mechanisms that always worked before? I think it’s the same process as myocardial hibernation and cerebral penumbra of injury. I believe that these localized areas fail to heal because of a localized decrease in oxygen utilization. Reverse this, and an area of chronic pain will become normal again. Reverse this, and an area of chronic degeneration will begin to regenerate exactly as it was supposed to in the first place. Here’s another question. Why does chronic pain and degeneration only occur in joints and ligaments instead of other tissues? And why do people heal so much more reliably when they are young than when they become older? The answer in both cases has to do with decreased oxygen utilization. Ligaments and joints are notoriously known as areas of decreased oxygen tension. The oxygen tension in a healthy ligament is often only 1/10th that of the tissue only several millimeters away from it. The same is true for joints. These areas are setups for developing a situation that involves a localized area of decreased oxygen utilization. But as we grow older, does our circulation improve, or does it decrease? Of course it decreases. So the natural decrease in oxygen utilization that is seen in the healthy ligaments and joints of the young become even further compromised with aging. So here’s the scenario for chronic pain and tissue degeneration that seems to correlate well with what I have clinically seen from using Prolozone in thousands of patients over these past 20 years. There is a naturally occurring decrease in circulation to ligaments and joints. This condition is further compromised with aging. The result is a naturally occurring localized decrease in oxygen utilization in these tissues. Then along comes a trauma. The trauma produces edema and inflammation causing a further localized decrease in oxygen utilization. This decrease in oxygen utilization produces a localized increase in lactic acid production, free radical damage, and necrosis which serves as the foundation for sensory irritation and injury, all of which causes chronic pain. The primary criterion for selecting a patient for Prolozone is pain. If it hurts, Prolozone should be tried. I have had cases in which the chief complaint was instability, and the patient had no complaints of pain. A classic example would be a recurring dislocating shoulder. Whereas Prolozone has worked well in many of these cases, my experience is that it should be combined with classical Prolotherapy for best results. The following is a list of conditions that have been found to be very responsive to Prolozone: chronic neck and back pain from any cause, rotator cuff injuries, degenerative and arthritic hips, knees, and ankles, degenerated discs, plantar fasciitis, carpal tunnel syndrome, TMJ, sciatica, heel spurs, neuromas, tennis elbow, sinus infections, pelvic disorders, dental infections, post-op pain, non-union fractures, painful scars, and sports injuries—basically anything that hurts. Learn more about Prolozone and if it is right for you! Dr. Cardamone performs this innovative treatment option for pain! Schedule a consultation! Sources : Extract from Journal of Prolotherapy. 2011; 3(2): 630-38.